A Great Series Needs a Great Logo! By David G. Firestone The NASCAR Sprint Cup Series has a unique tradition that stretches back to the 1970’s, the Series Logo. Series Logos are now commonplace in most forms of racing, excluding Formula 1, which does not need a series logo. The evolution of the NASCAR Sprint Cup Series logo over the years in interesting. 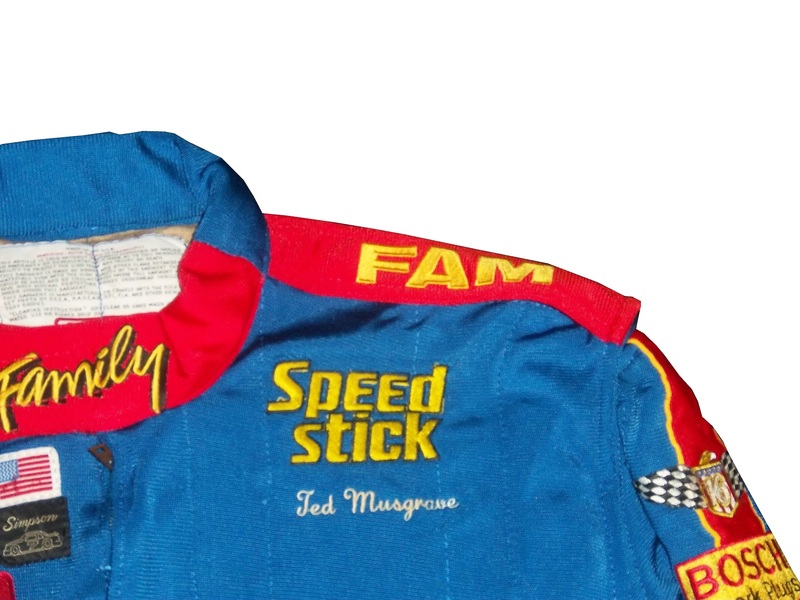 1972-1981 This logo is designed in classic 1970’s design, and can be seen on driver suits, as this Dale Earnhardt Sr. example from 1980 clearly shows. 1982-1988 The “1 Car” logo was a major redesign, and features a logo, with NASCAR GRAND NATIONAL SERIES embroidered, and a 1980’s car. 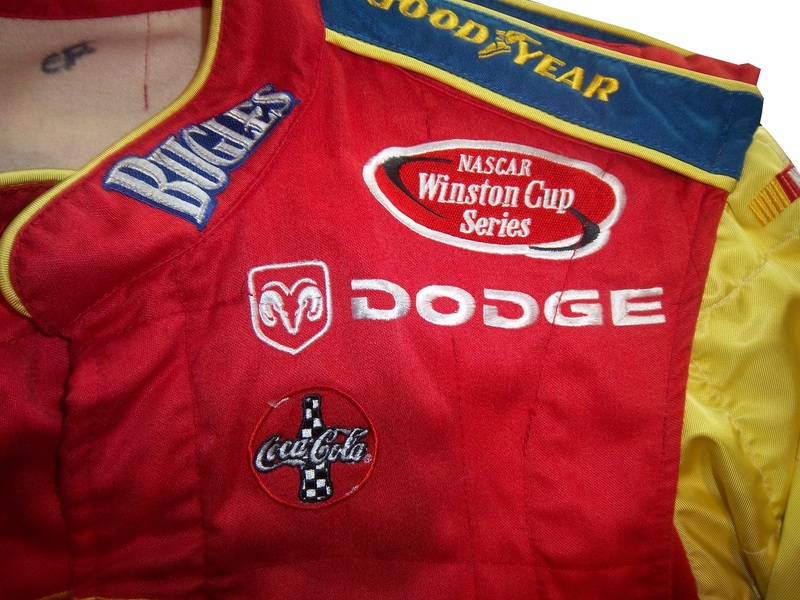 Very visible on driver suits from the era. 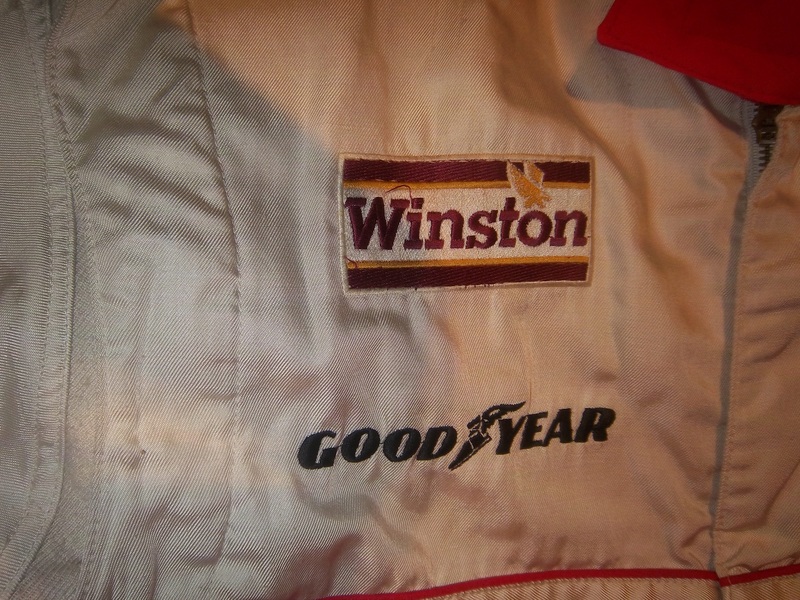 1989-1992 A simple Winston logo, which, while underwhelming is very visible on this Bobby Hillin Jr. Suit, and this photo of Dale Earnhardt Sr. from 1992…and look who is next to him! 1993-1996 Again an underwhelming yet attractive series logo. 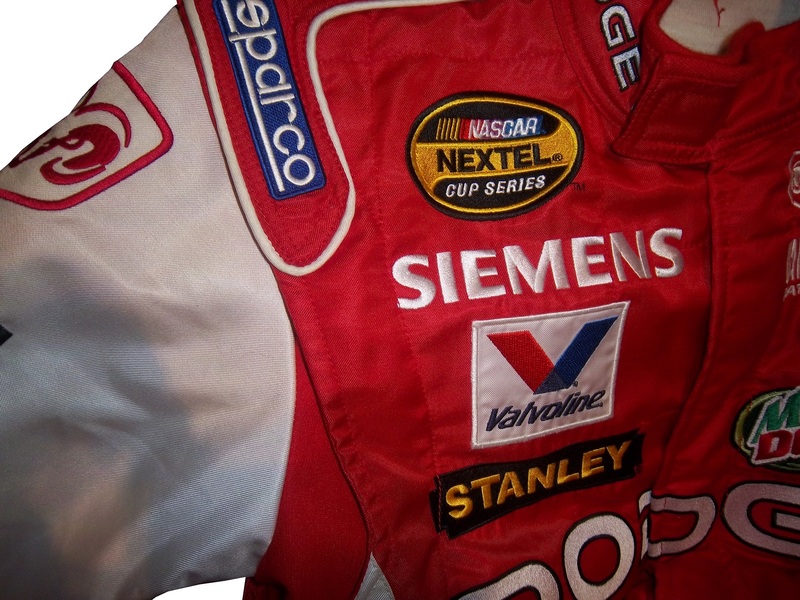 The interesting thing about logos from 1993-2001 is that there are two designs, red with white lettering that displayed better on light driver suits, and white with red lettering that displayed better on dark colored driver suits. Though the rule was rather ambiguous for a while. 1997-1999 This design went through some changes when Winston changed the design of their packaging. 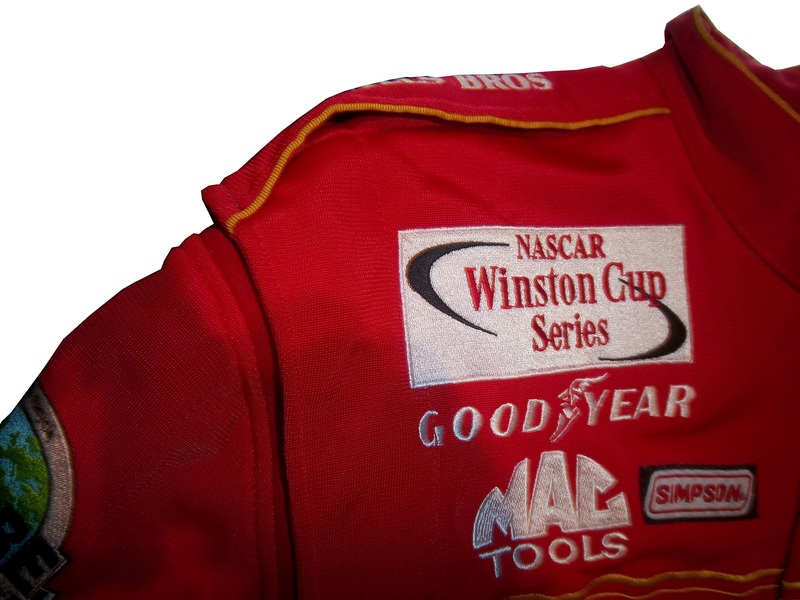 Starting in 1998, Winston went from a rounder typeface to a narrower and straighter typeface, as a young Tony Stewart is modeling. 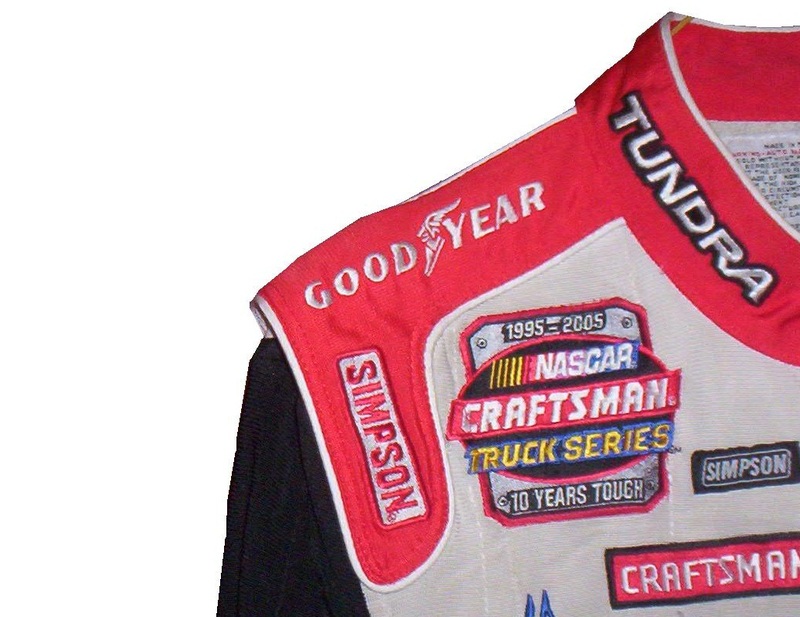 1998: Every team and driver ran the NASCAR 50th Anniversary logo on their cars and driver suits. Not bad at all. 2000-2001 A square design with an oval logo was used from 2000-2001, with the color-flipping returning. 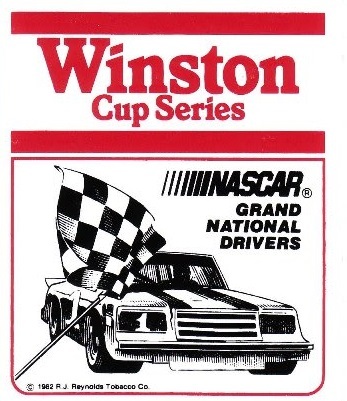 At this point, the discussion of who would replace Winston started, as due to legislation, cigarettes would not be allowed to sponsor auto racing within the next few years. 2002-2003 The transitional oval logo. The Busch Grand National series had adopted an oval logo in 1995, and since the series would change sponsorships in 2004, this new logo would be the bridge between the old and the new. 2008-Present: Same color scheme, same shape, same basic design. 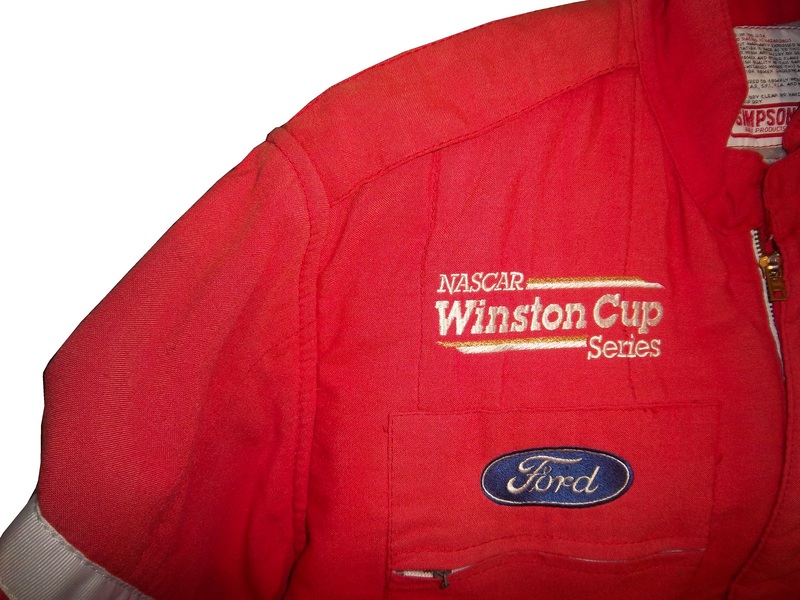 The logo has become a marketing point for NASCAR teams and NASCAR itself. 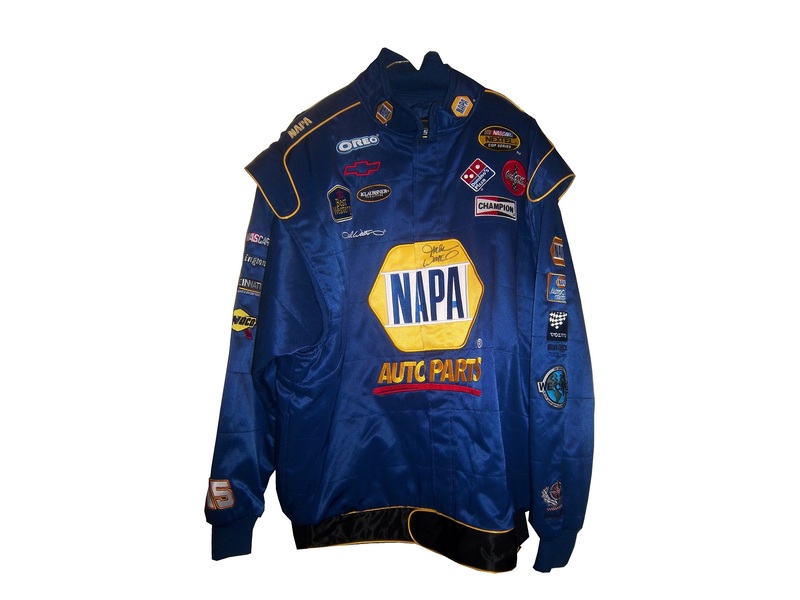 Die casts, driver uniform coats, t-shirts, pit crew shirts, and many other items carry these logos. 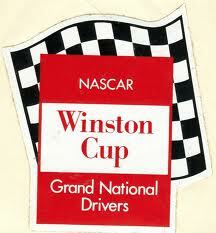 1982-1994 These two logos were used for the Busch Grand National series. The plain Busch logo worked better and was used more often than the Busch Beer Series logo. 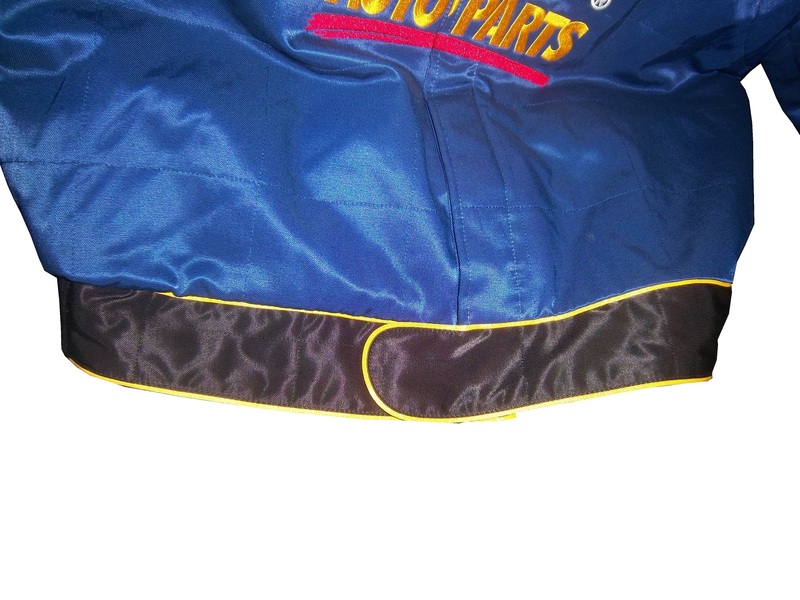 1995-2004 An oval logo with the sponsor name, and GRAND NATIONAL SERIES added below. It was very marketable and worked quite well as a logo. 2004-2007 Grand National Series has been removed, and some minor redesigns to BUSCH and the NASCAR logo as well. 2006 featured the 25th Anniversary logo. 2007-Present Complete redesign for the NASCAR Nationwide Series which began when Nationwide took over the titular sponsorship of the series. Uneven oval with a Nationwide logo, and a NASCAR logo, with a new overall design and color scheme. 1995: For the first season, the Truck Series was referred to as the “Super Truck Series by Craftsman.” It featured a decidedly early 1990’s logo. It lasted for only one season. 1996-2002 The Craftsman Truck Series is a better name and the logo, while still bearing a 1990’s style design, is more refined and professional. 2003-2008 The entire logo is inside the oval, some minor color and typeface changes are present as well. 2005 featured the 10th anniversary logo. 2009-Present The same off-center oval design as the Nationwide Series and Sprint Cup logos, with a sponsor redesign for Camping World, who took over for Craftsman after 2009. David Ragan #34 Peanut Patch Hot Boiled Peanuts/Race Trac Ford Fusion While the color scheme brings back memories of the Houston Astros Tequila Sunrise jerseys, the overall design is good. I like the mountain-esque design, but the random peanuts scattered over the hood and quarter panels are just awful. I really want to give this a better grade, but a C- is the best I can do for this scheme. Aric Almirola #43 Rain Eater Wiper Blades/Charter Communications Ford Fusion This color scheme works very well, except for the hood logo, where the green logo is next to invisible on the Petty blue of the hood. But even so, the scheme as a whole works very well, so I’ll give it an A.
Ryan Truex #51 Seawatch Chevy SS Having never heard of Seawatch, I thought it was an activist group at first, but Seawatch is actually a very well established clam company based in Maryland. The overall design is really good, though the wave next to the rear wheel well is a bit out of place. Still it looked very good on the track, and I give it an A.
Dale Earnhardt Jr. #88 National Guard/Breast Cancer Awareness Chevy SS Oh God! October is coming therefore, the pinkwashing must start. For those who don’t know the term, “Pinkwashing” is the process of using pink ribbons and/or the pink color to sell products, many of which are inherently unhealthy, with a “portion of the proceeds going to support the fight against breast cancer.” Sadly, most of these funds do not go to serious research, but rather to “feel good” causes such as the Susan G. Komen foundation. Because it is used as a marketing gimmick, and I, as well as my mom who is a breast cancer survivor are opposed to pinkwashing, any and every pink paint scheme, regardless of how good it looks, will earn an automatic F- grade. Michael McDowell #98 Victory Junction Ford Fusion Unlike Komen, Victory Junction is a cause most people can support. Founded by the Petty Family, after the death of Adam Petty, Victory Junction is a camp for children with terminal and chronic illnesses, so while they are there, they can forget about the troubles of life, and have fun. That said, this is a great scheme, with a very simple yet attractive design, and great colors. The only bad thing I can say about this scheme is that I would love the logo on the quarter panels. That one thing can’t take away from an A+ scheme. 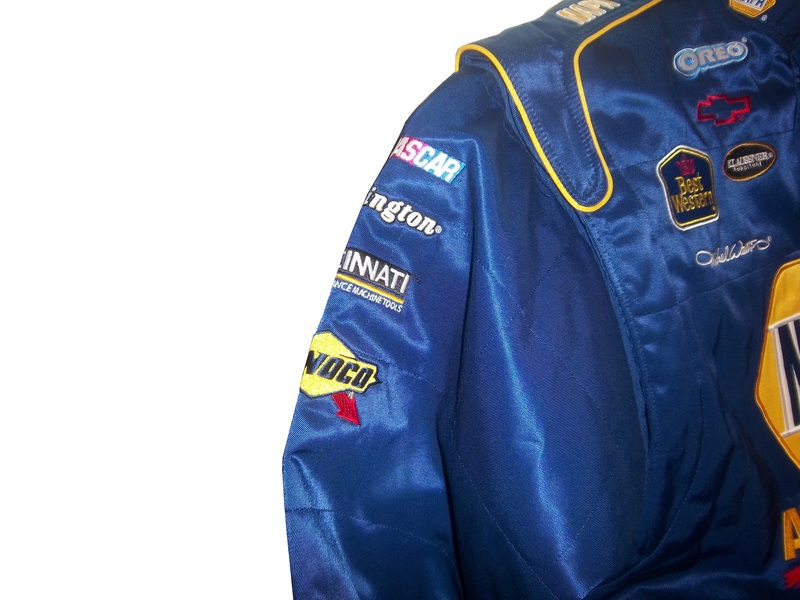 Last week, we discussed this “prototype pit crew suit” from the prototype aspect. This week, we will discuss the pit crew aspect. 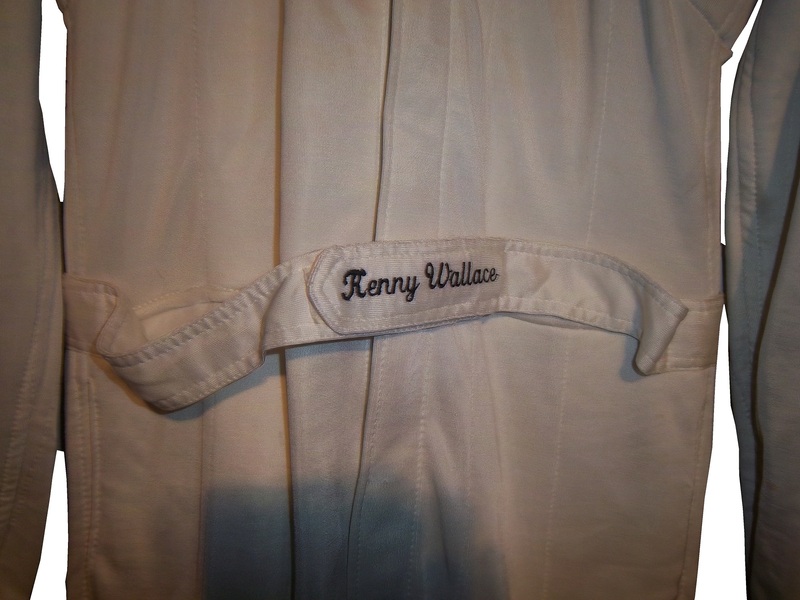 This is a very interesting aspect of racing suits. Pit crews have a very dangerous job. They have to change 4 tires, make any adjustments, and refuel the car in a matter of seconds. The risk level is as high as you could possibly imagine. Fire is a frequent risk, especially when refueling the car or repairing the damage from a wreck. 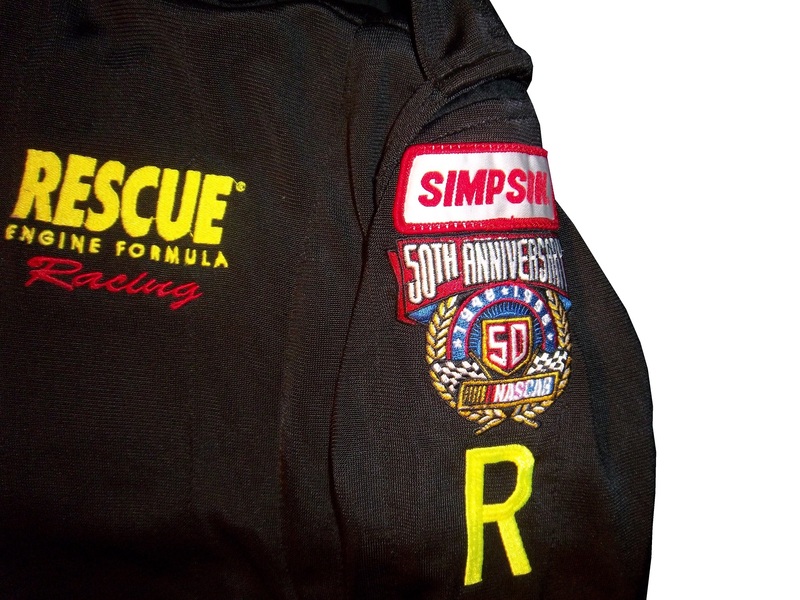 As such, pit crews are required to wear fire protection identically to what the driver wears. This footage is from the 1984 Miller High Life 400 in Charlotte. Note what the crews are wearing in this pit stop. That was from earlier in the year, and none of the crew members from that incident were seriously hurt. While most crew members have the option of one or two piece suits, those involved in refueling the car don’t have a choice. NASCAR uses high octane E85 fuel, which is an 85 gasoline/15 ethanol mixture. IndyCar uses an ethanol blend, which is not as flammable, but will still burn if ignited. Marco Andretti’s crew accidentally set his car on fire during a race last year. Again, no crew members were hurt. Gas men wear a one-piece suit, with a full-face helmet, thick gloves, and racing shoes as shown here. 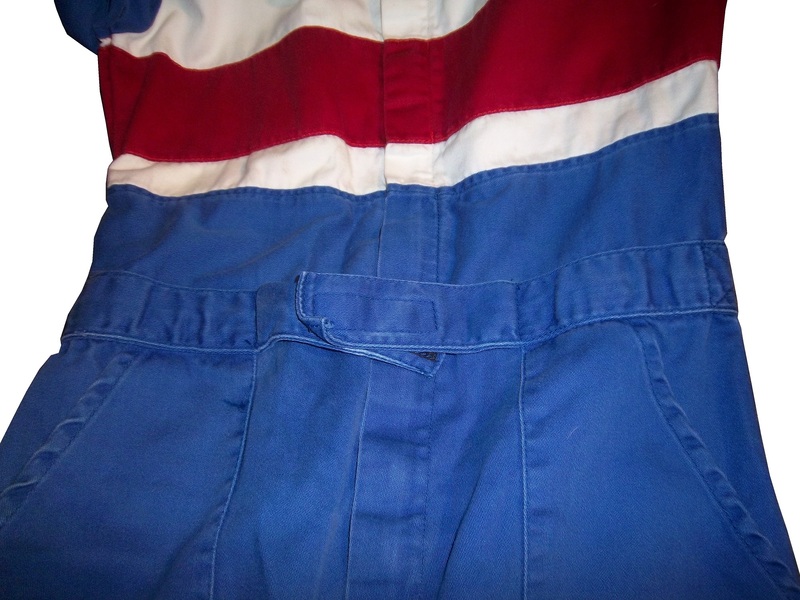 Crew members often wear two-piece suits, as it provides the wearer with less restriction in movement than a one-piece, which comes in handy when changing tires. Tire carriers, changers, and jack men wear open-face helmets, frequently with LED lights for extra visibility at night races. 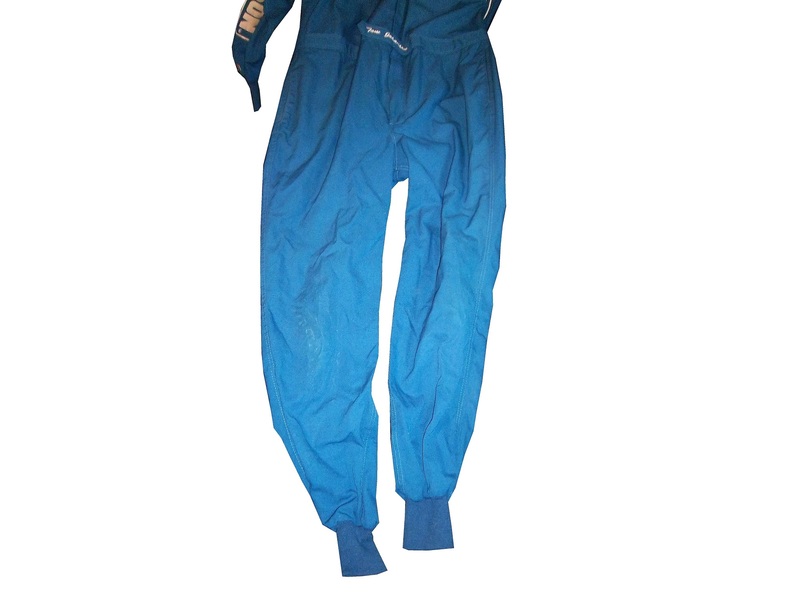 Remember that the ultimate goal of a driver or pit crew suit is to protect the wearer from fire. The protection may be uncomfortable. The suit might be hot, or constrictive, but all that matters is that the wearer is safe. 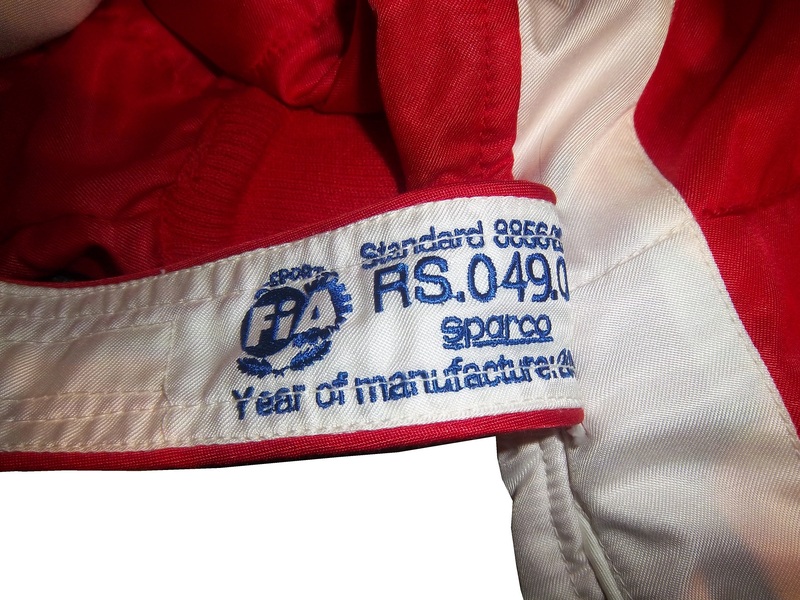 SFI and FIA certification comes standard on these suits. The risk on pit road is transparently clear to the crew members, and these uniforms are designed to keep the crew from being injured in case the worst case scenario happens. Ok, for the next two weeks, I am going to focus on one single suit. 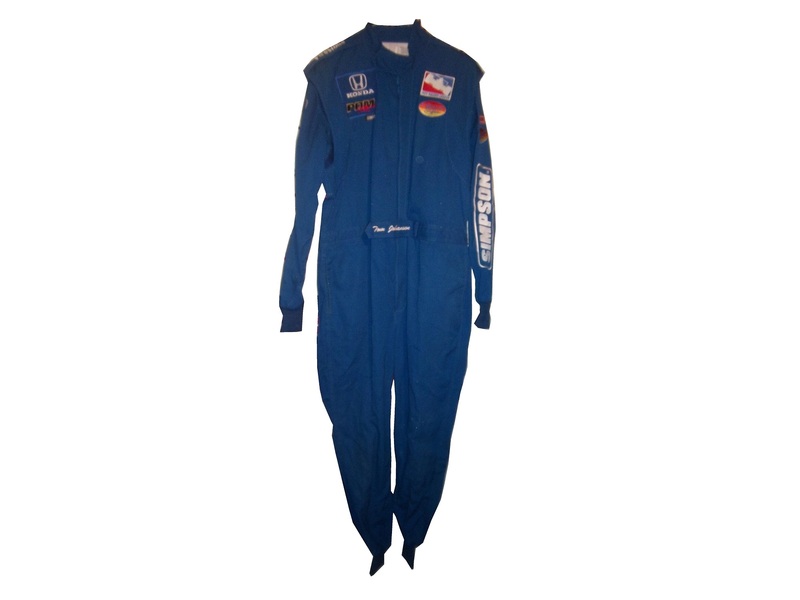 This is a “prototype crew suit.” In other words, it is a prototype suit for a pit crew member. In that light, I will do two articles, one focusing on the “prototype” part and the other will focus on the “pit crew” part. This is a prototype suit. What that means is that this suit was made up to see how various design aspects work. 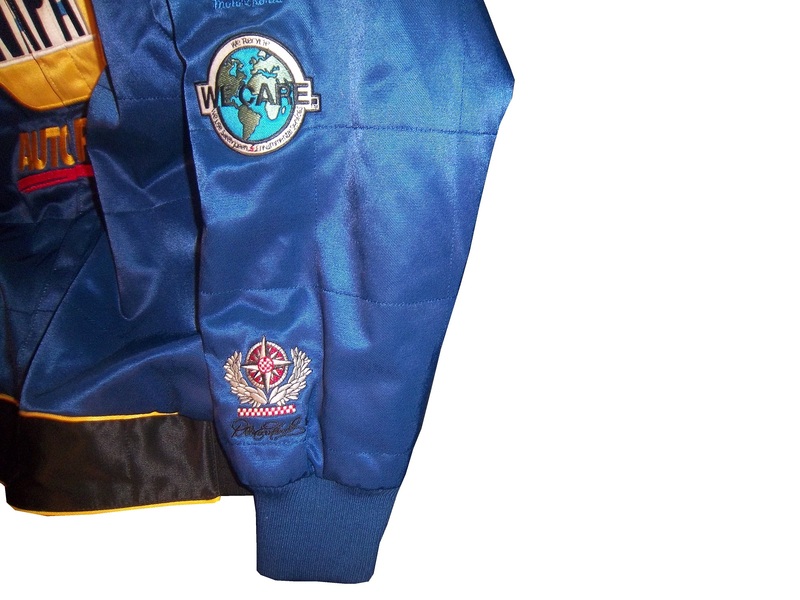 The designers will attach various aspects, stripes, sponsor patches, to a full-size mockup of a suit, usually a single-layer suit, to see how the suit will look like when finished. Since driver and pit crew suits can cost as much as $1500 each to make, this is a simpler and cheaper way to design a suit in full-size. A full size mockup looks very impressive. The designs can be changed as needed. Prototype suits are made from a single-layer suit. 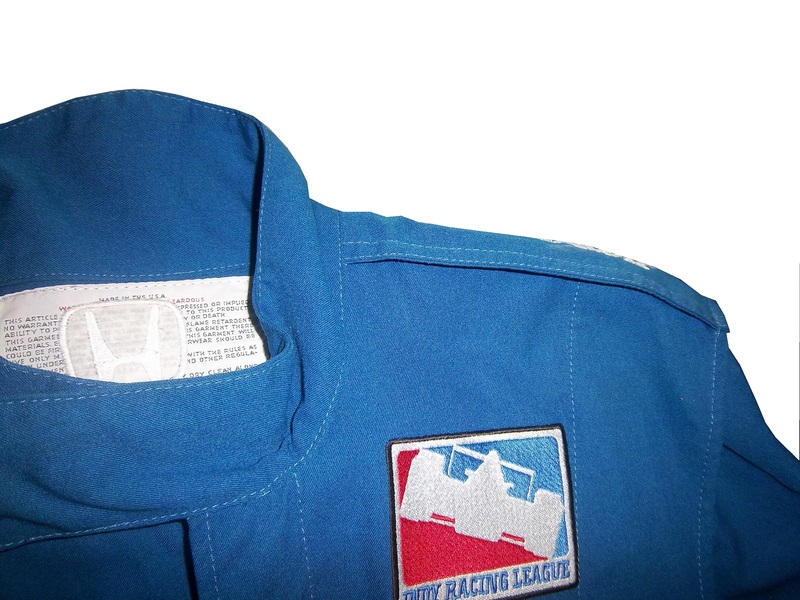 Single-layer suits are cheaper to use, but provide little protection in case of fire, so they are not often used in race condition. Suit design has, in the last 20+ years gone from not an issue to very critical. 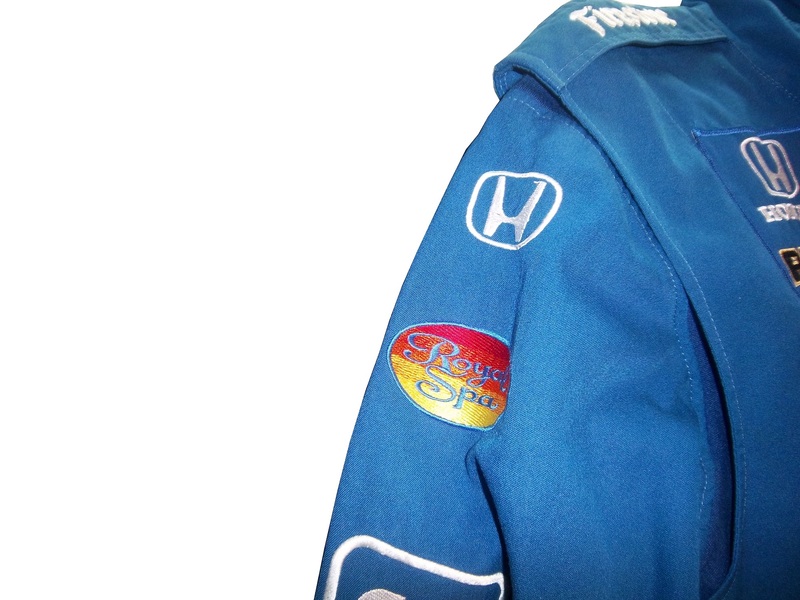 Because suits are used for promotion for the primary sponsor, the design aspect is very important. 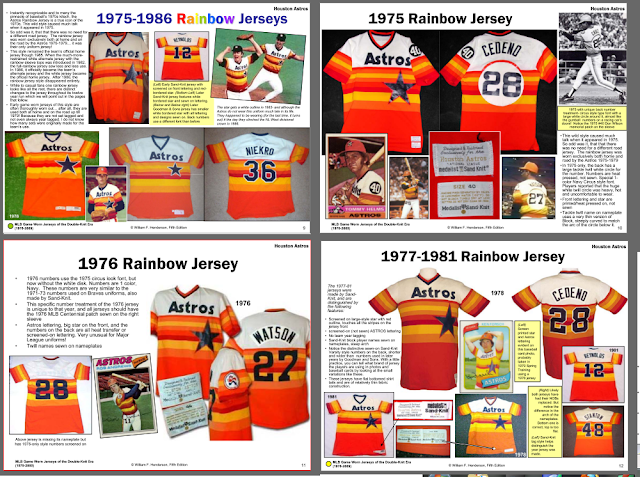 Every aspect, from the colors, to the primary and associate sponsor patches, to the decorative design is taken into consideration. 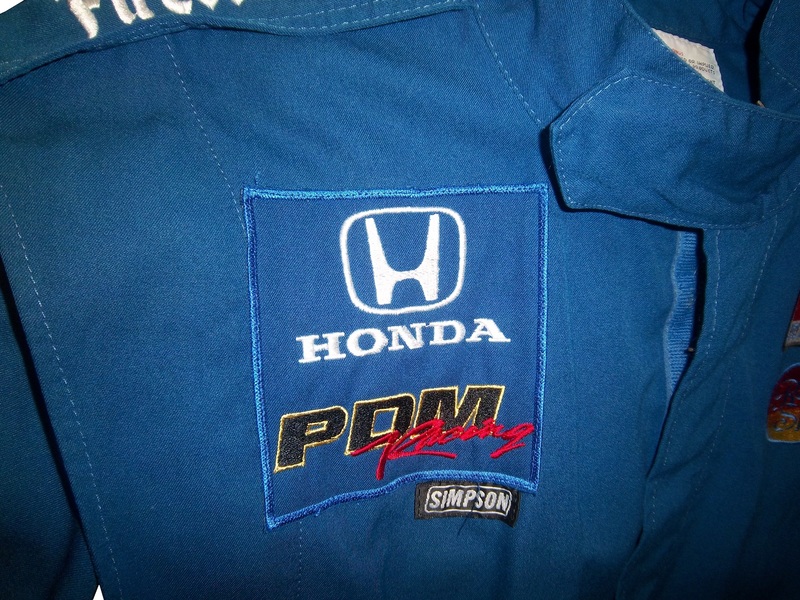 The right chest has a HONDA and a PDM RACING logo. 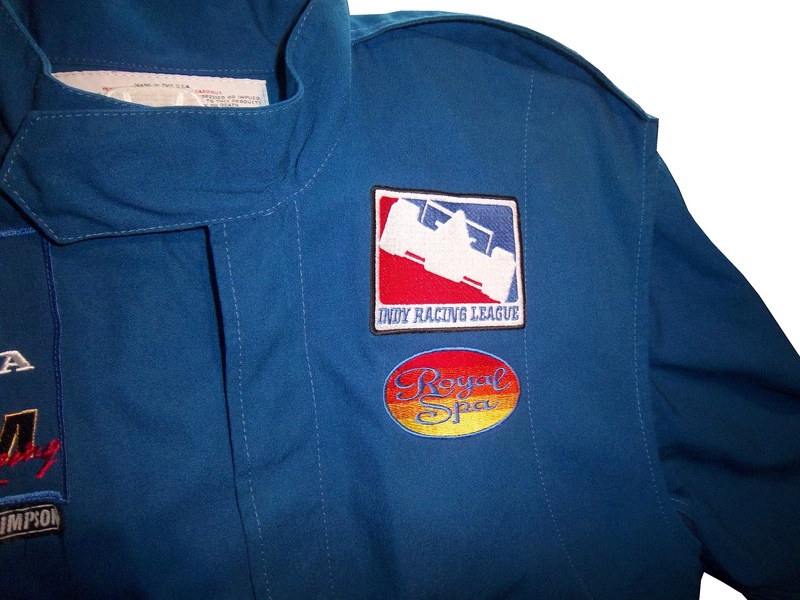 The left chest has an INDY RACING LEAGUE logo and a ROYAL SPA logo. The belt has TOM JOHANSEN directly embroidered into it. The legs are cuffed. 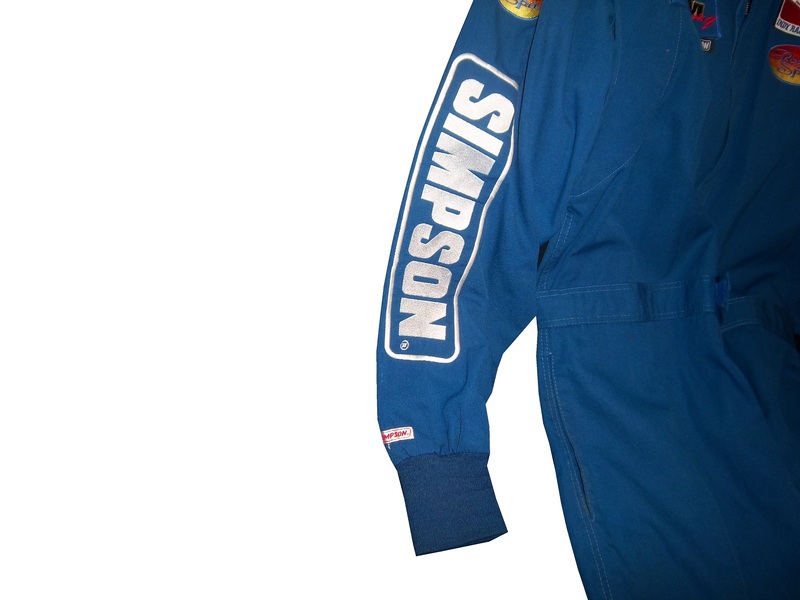 The sleeves have small logos on the top, and large SIMPSON logos present the bottom. 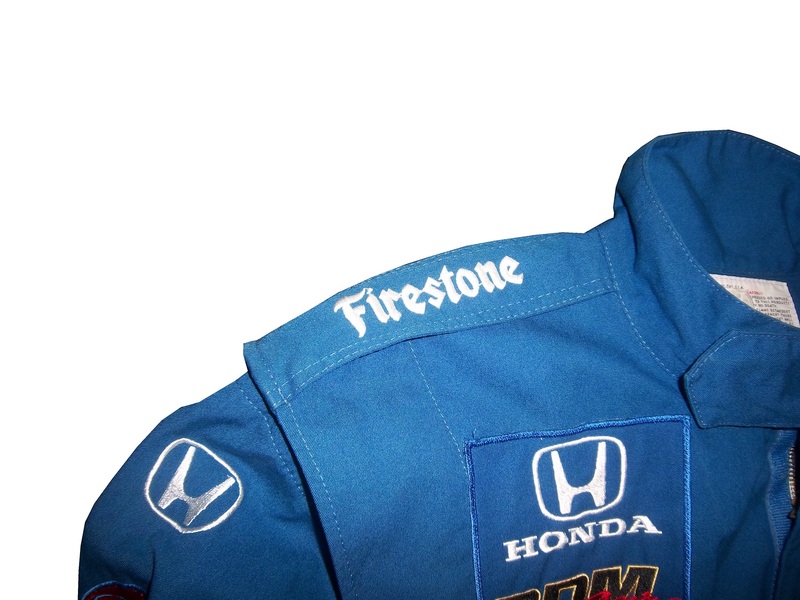 The shoulder epaulet have FIRESTONE logos present. 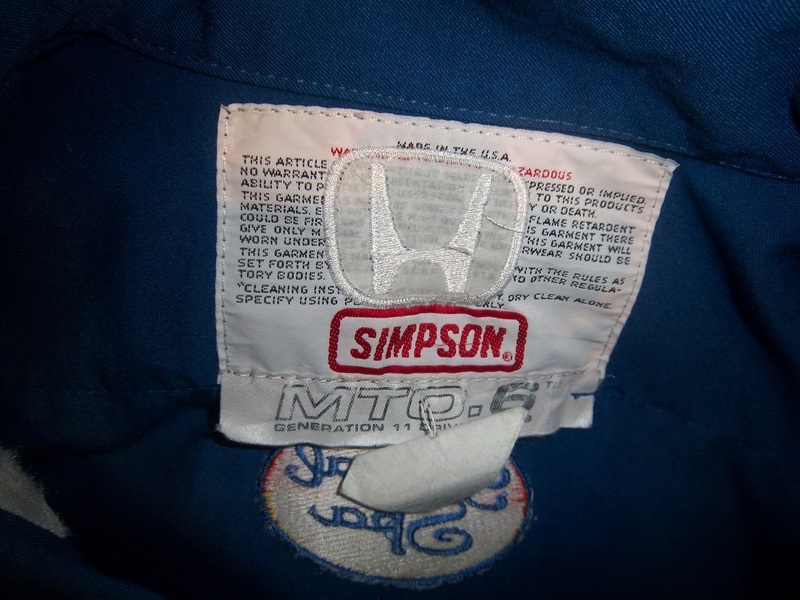 The back cowl has a HONDA logo that covers part of the tag. 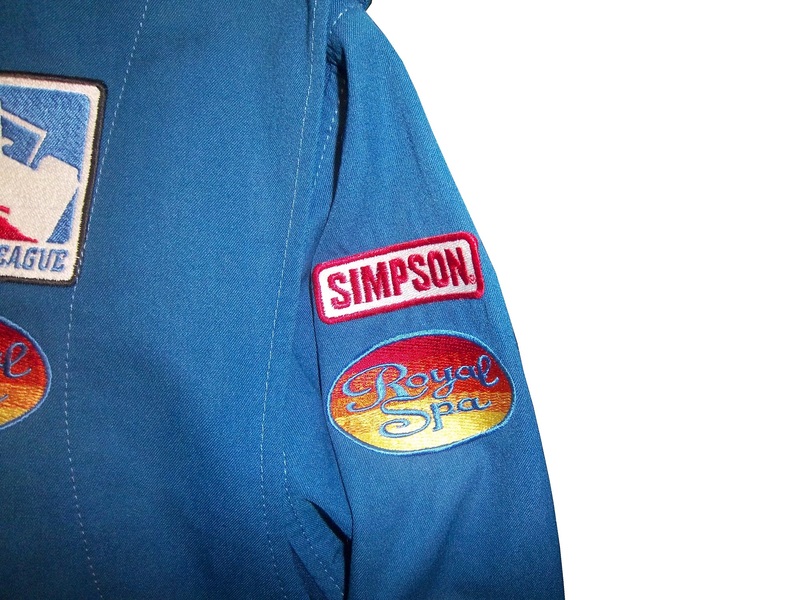 The back Torso has a large ROYAL SPA logo, Royal Spa being the primary sponsor at the time.seThe suit shows no wear to speak of, nor does it have any safety certification. 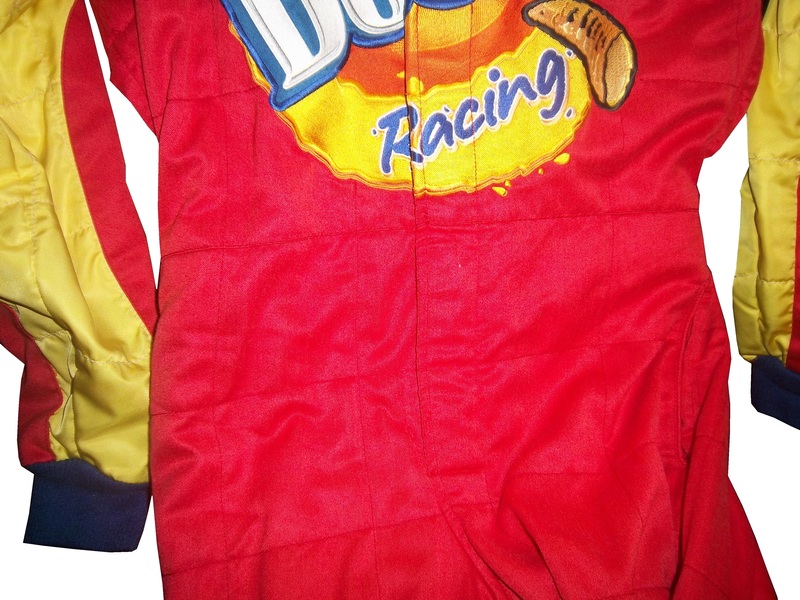 The question is asked, did this suit see race-use? 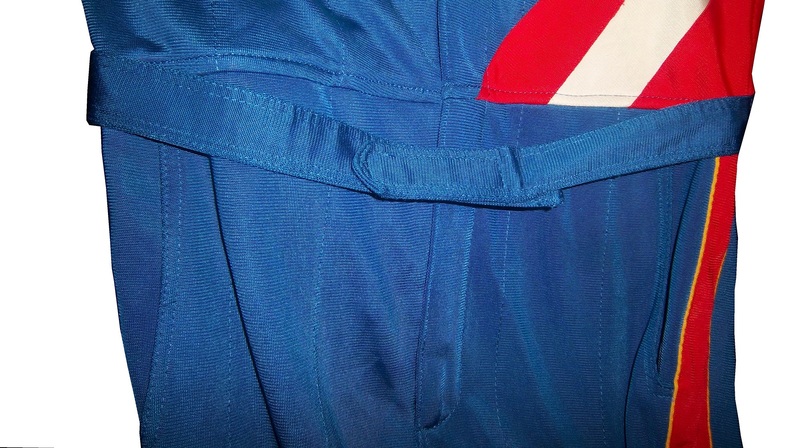 While the suit itself shows no wear, it seems likely that it did in some form see race use. PDM Racing was always a sub-par team, and they were always a low-budget team. 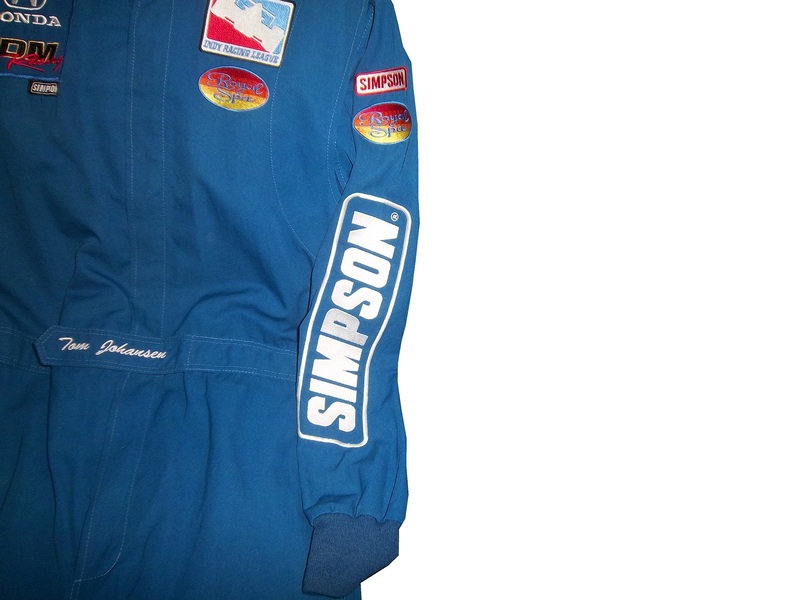 An inside joke was that PDM stood for “Poor Dumb Mechanics.” So the fact that this suit was made would indicate that it was used by Johansen. 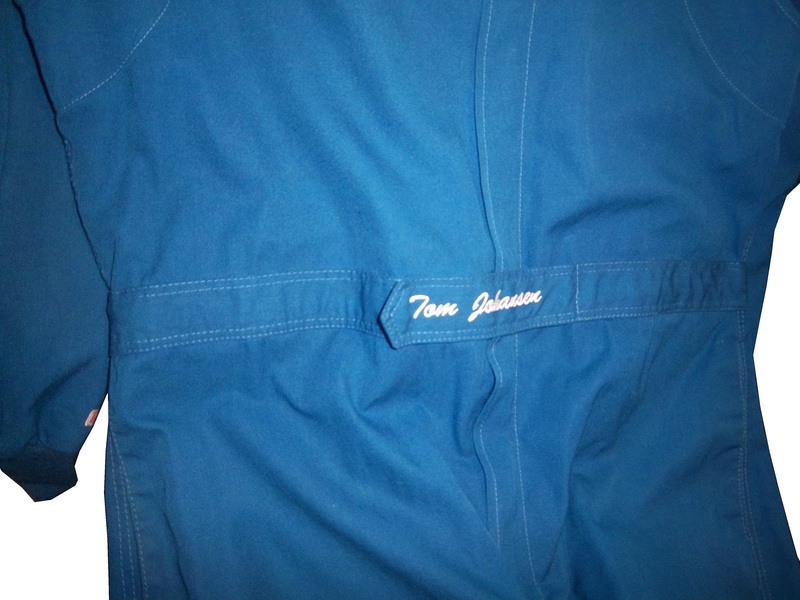 However what part Tom Johansen served on the crew is unknown. On the other hand, a single-layer suit such as this would not provide much protection for the wearer in the very real threat of a fire. The suit material feels very light, and the wearer would have been seriously injured if a fire had taken place. The deciding factor for me is that the suit shows no wear. 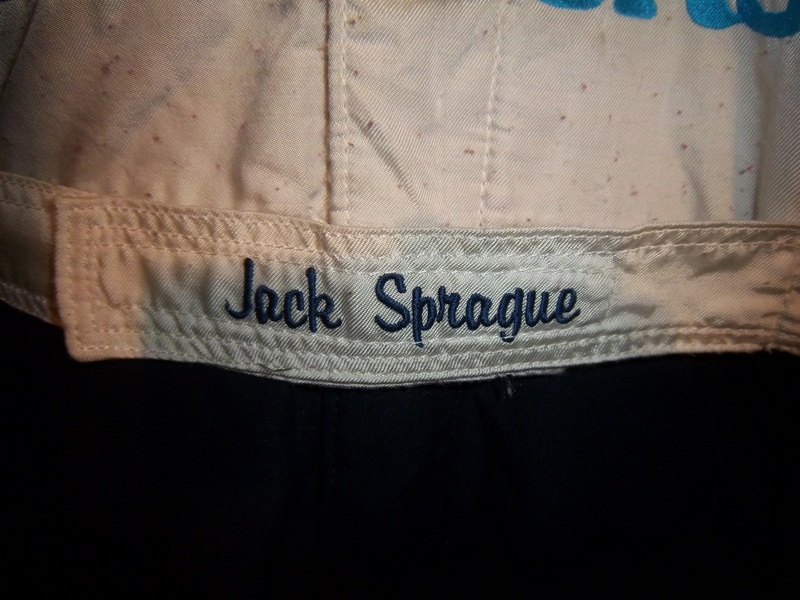 I have suits in my collection that have been worn for only a few races, but have a lot of visible wear, and for a pit crew suit, that is pretty telling. Prototype suits provide little protection in case of fire, unlike pit crew suits which are designed to give the wearer as much protection as possible, which we will examine further next week. Ryan Newman #39 Haas 30th Anniversary Chevy SS Haas has a great scheme already, and the all-black look really works well here. To give this scheme anything less than an A+ is unfair. Brian Keselowski #52 Star Coach Race Tours Toyota Camry Are you f***ing kidding me? I have to give them credit, they took the worst scheme in NASCAR this year, and found a way to make it even worse. The color and design are horrific, and bonus points for putting blue lettering in the green camo, thus making it nearly invisible. Giving this scheme an F– does not go far enough! WORST SCHEME THIS YEAR! 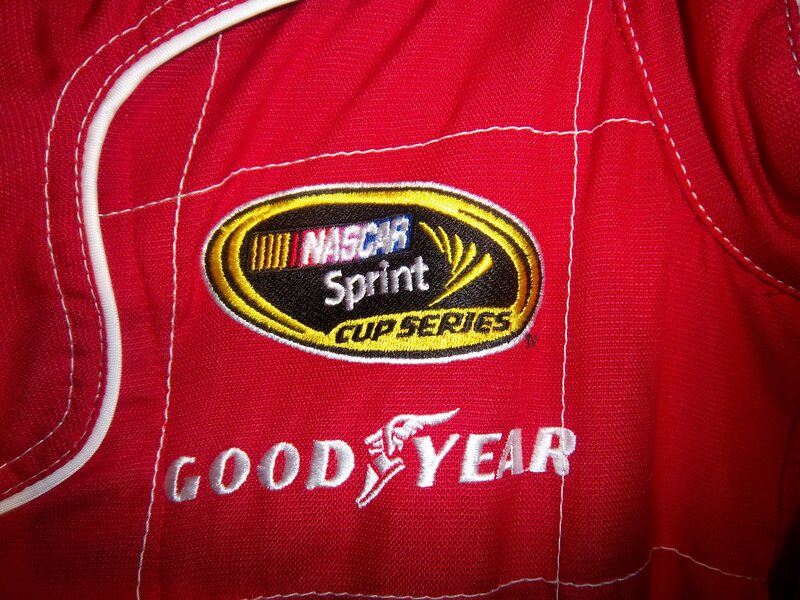 While I’m primarily a driver uniform guy, I collect other stuff as well. I like game-worn and game-used memorabilia, space-flown stuff, and Presidential bill pens, amongst other things. Last Saturday, I spent the day at the National Sports Collectors Convention in Rosemont Illinois. The NSCC, or “The National” is the biggest sports memorabilia show in the United States, and features hundreds and hundreds of sports memorabilia dealers from all over the country. 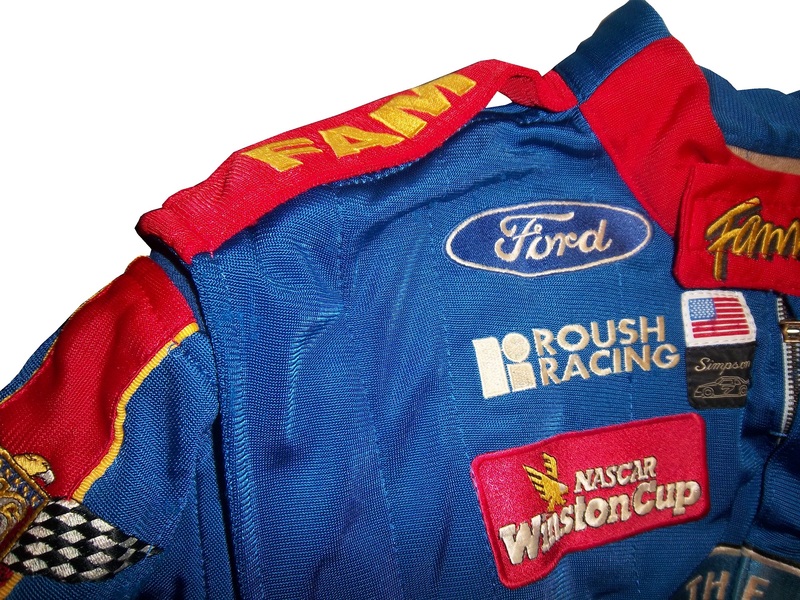 I go to these conventions on a regular basis, and something that I noticed in recent years is that racing memorabilia is present at these shows more and more, as the racing memorabilia market expands. I go to these shows with an open mind. What I don’t want to do is to go there wanting something specific, and pass up the chance to get an item that I really want. I find myself making offers and deals on items I would never would have dreamed I would buy. 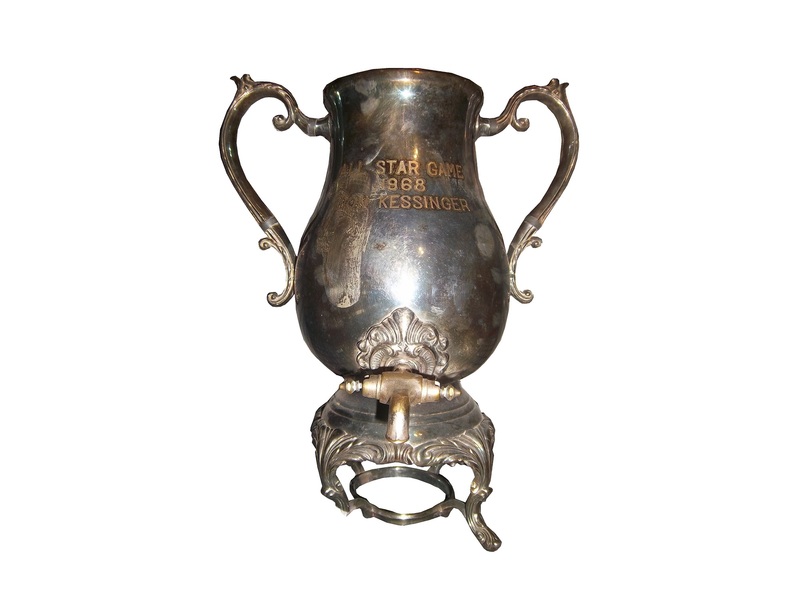 I went to a show in March, and came away with this Don Kessinger 1968 MLB All-Star Game trophy/coffee pot. 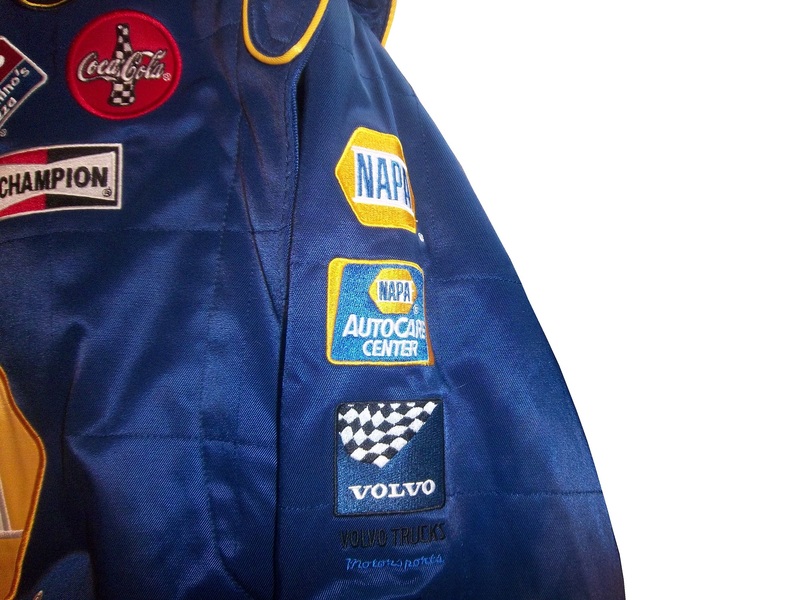 While racing memorabilia has a bigger part in these shows, what I DON’T see are driver suits. These shows, especially the National, features dealer and stores from all over the country, and they can only bring so much of their inventory to these shows. Transporting a driver suit from one state to another for a sports memorabilia convention, can be problematic at best. I have however seen driver shoes, gloves, helmets, sheet metal, and pit crew clothes at these shows, and you never know, I may see a driver suit at a show in the near future. Die casts, especially autographed ones are abundant at conventions, and I usually pick up one or two of them. 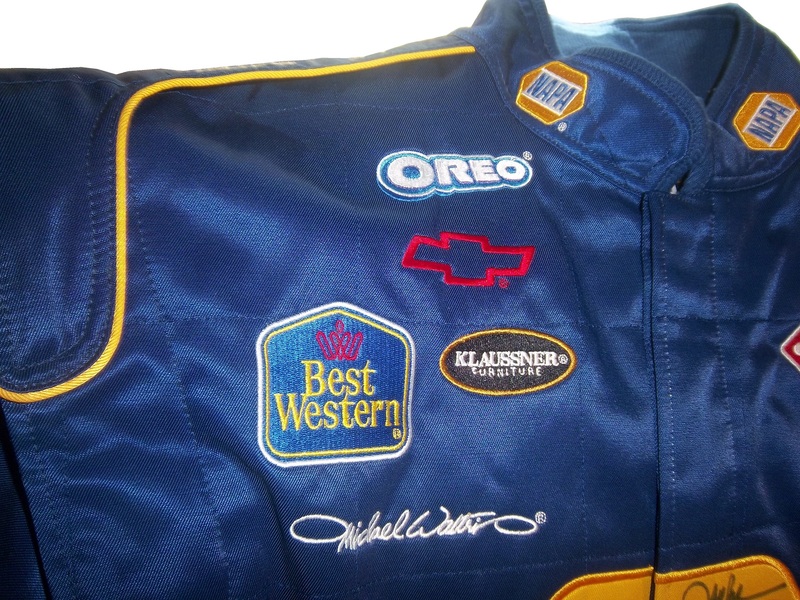 I picked up this very spiffy Michael Waltrip autographed jacket base on his 2004 driver suit. 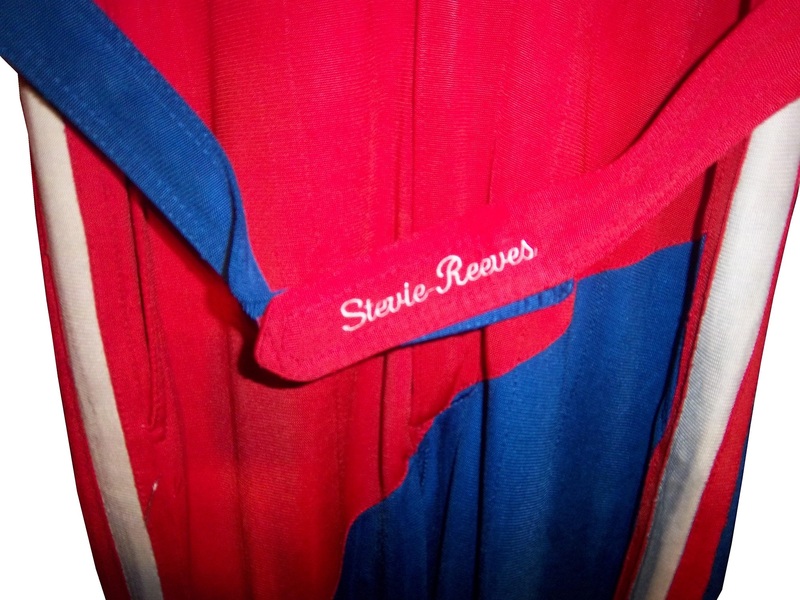 This jacket is notable in that it is very accurate when compared to his suit. 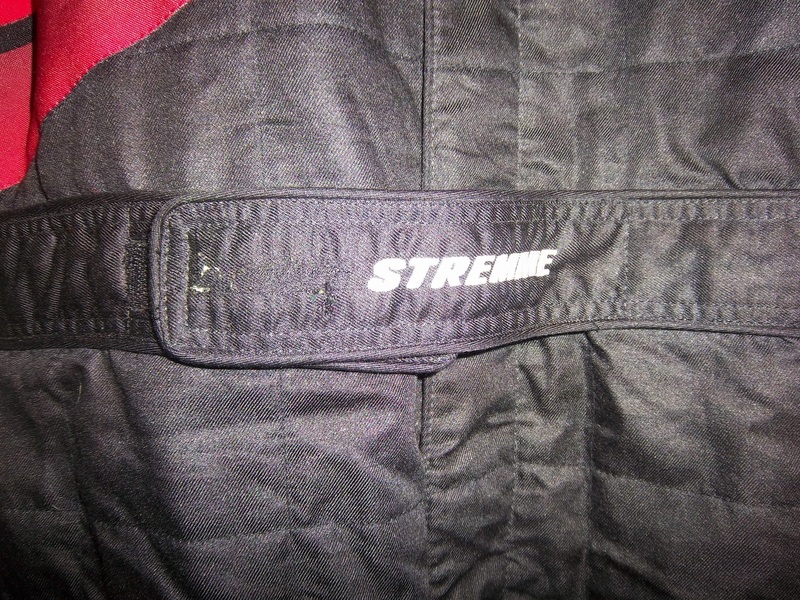 It has arm gussets, which I have never seen on a jacket before. 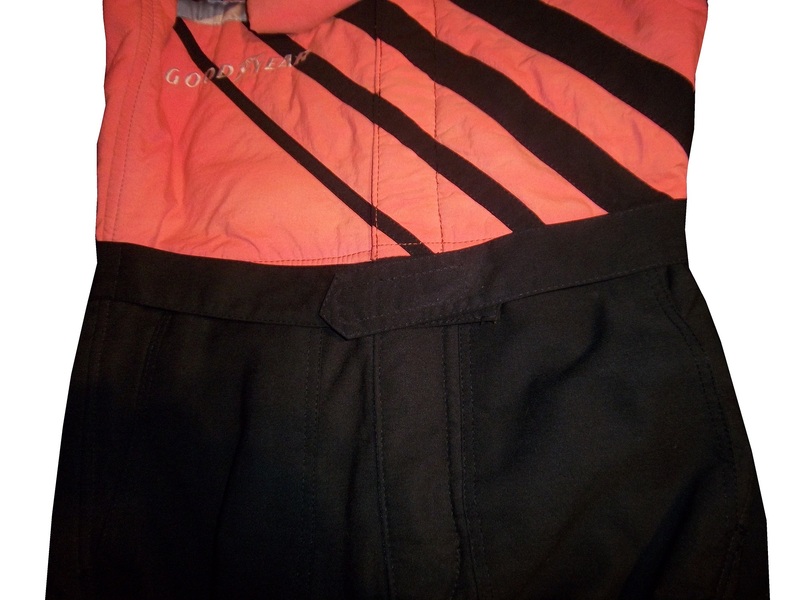 The material feels like the material that the real suit is made from, and is as heavy as an on track suit. 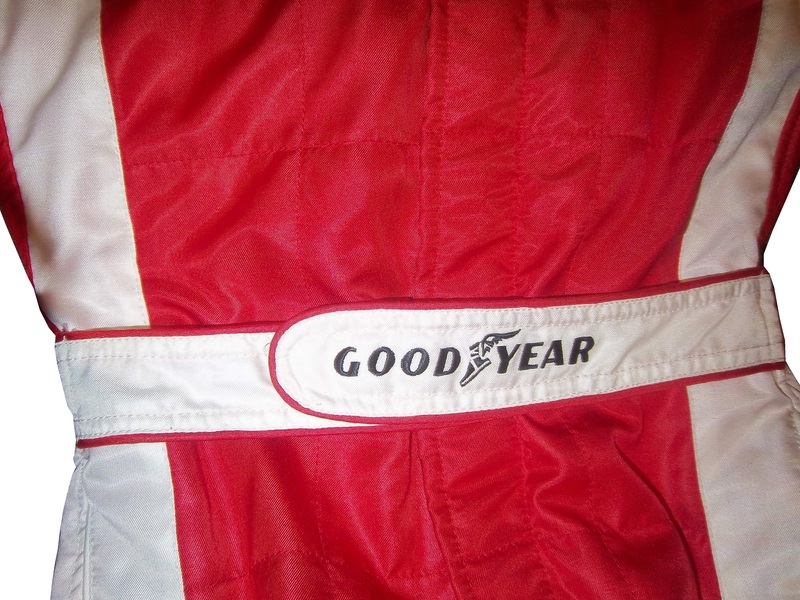 It has a belt, though the belt is black, whereas the suit belt is blue, and Waltrip’s signature is embriodered into the side of the jacket, where a Goodyear logo is embroidered. 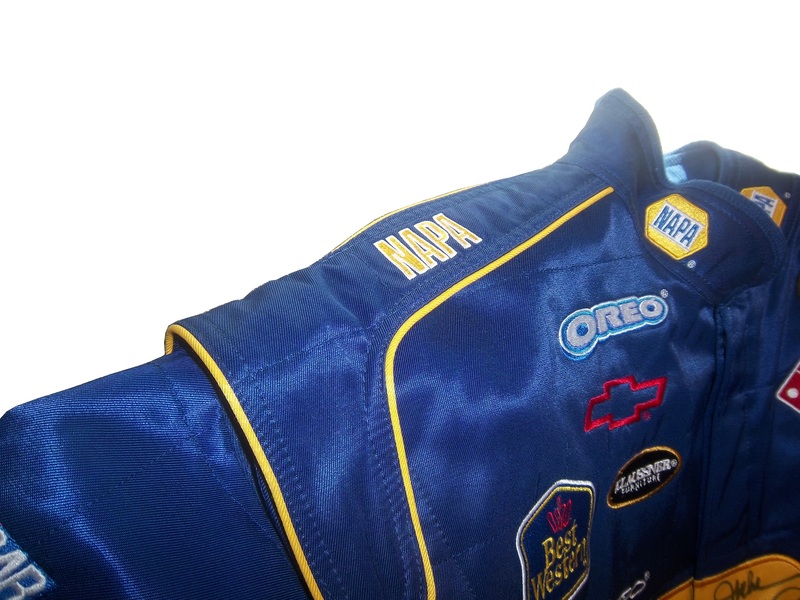 Waltrip’s name would normally be sewn into the belt in yellow lettering on a blue background. 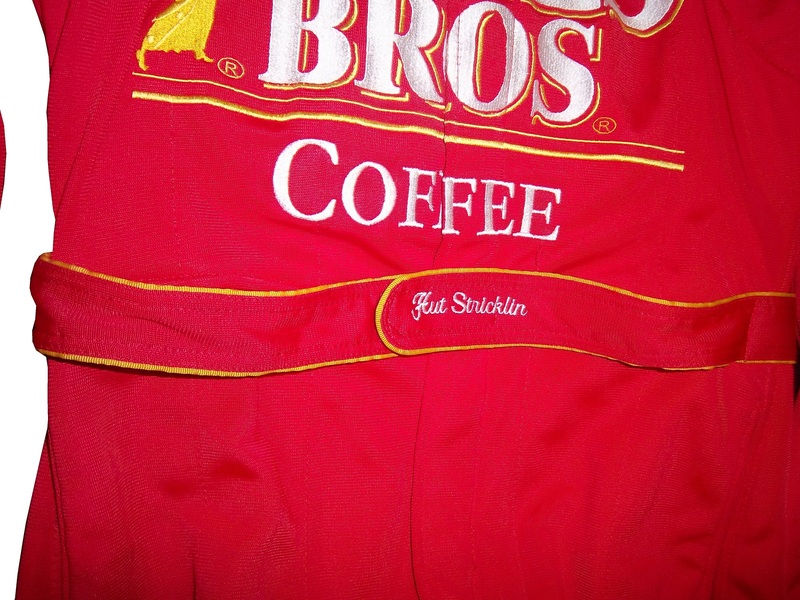 The arm logos are very accurate, and just like the suit, there are no television logos on the ends of the sleeves. 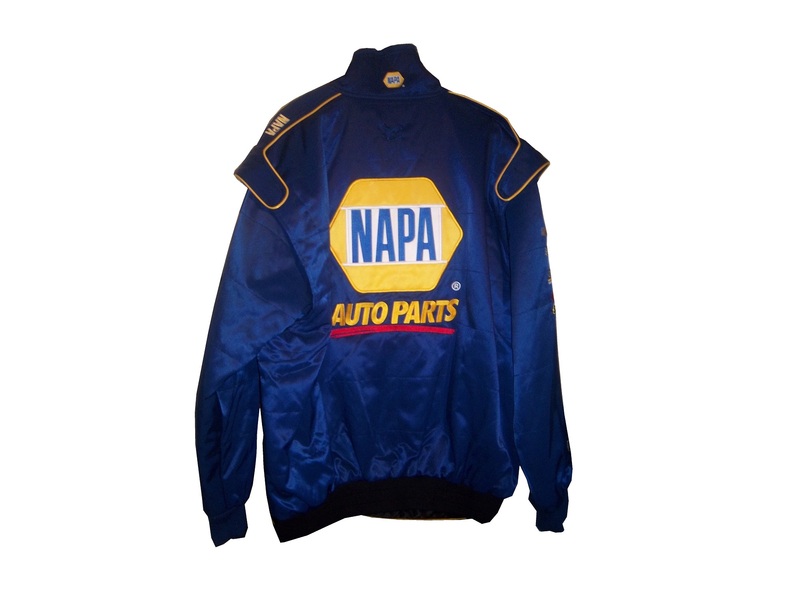 Michael signed the jacket on the front NAPA logo. 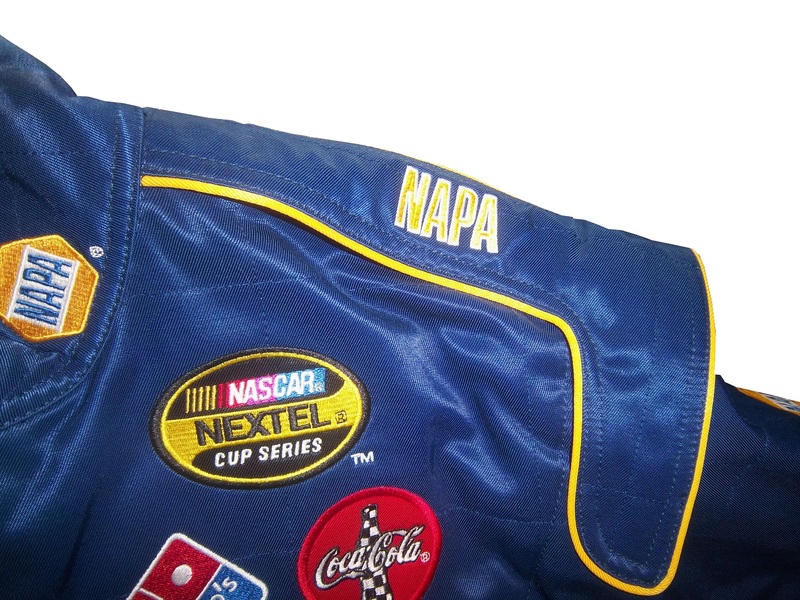 An identical NAPA logo is on the back. 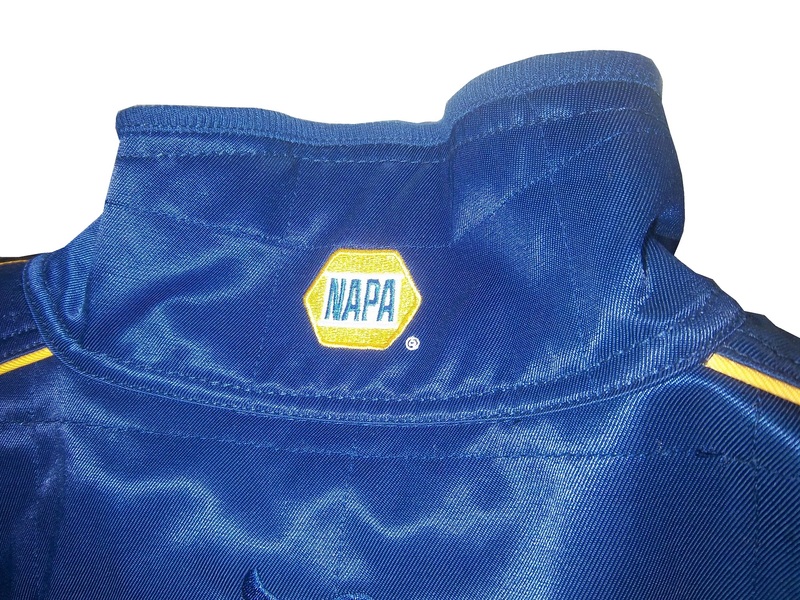 And instead of a safety certification, there is a NAPA logo on the back of the neck. I also bought a coin and die set from the U.S. Mint. 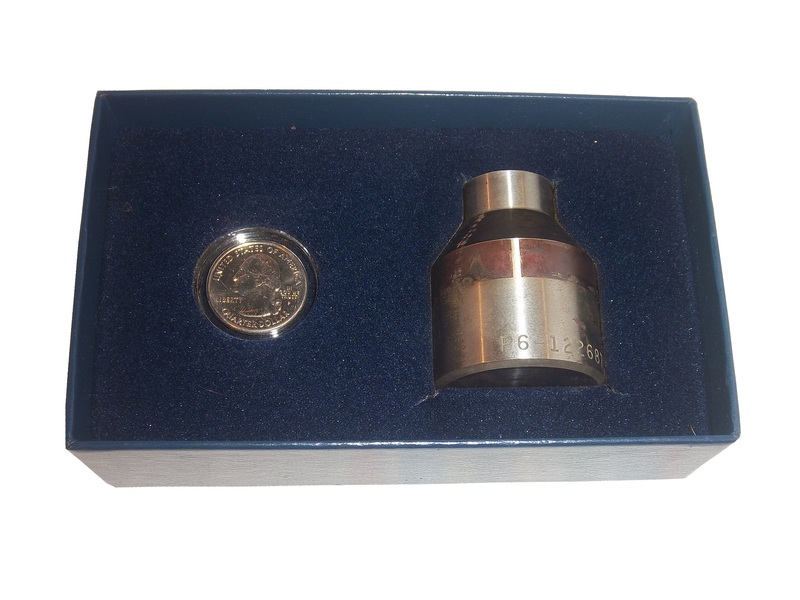 The large round object is a die used to press coins. A classic tailgating recipie is chili. It works well in the late summer and fall, and is very easy. This is a recipie that I personally use, and it is unique and has a kick to it. In two large saucepans over medium heat, using one pan for half the ingredients each, combine the chorizo and onion and saute until meat is browned and onion is tender. Add the stewed tomatoes with juice, smoked chipotle peppers with juice, tomato sauce, beans and water. Season with the chili powder, garlic powder, salt and ground black pepper to taste. Bring to a boil, reduce heat to low, cover and let simmer for 15 minutes. Jeff Burton #31 GutterClear 365 Chevy SS Um…Who did the decals on the quarter panel? Why is the logo bent over the top of the deck lid? It looks odd, and it doesn’t do the car any favors. The CAT logo on the light blue background looks forced and awkward. The bad part is that if those two flaws were fixed, this would be a very solid scheme. I love the colors, and the overall design looks amazing, but the rear sponsor is just awful. I will give this scheme a C+ It is good but it need some work. Getting the Belt…Not Always a Bad Thing! 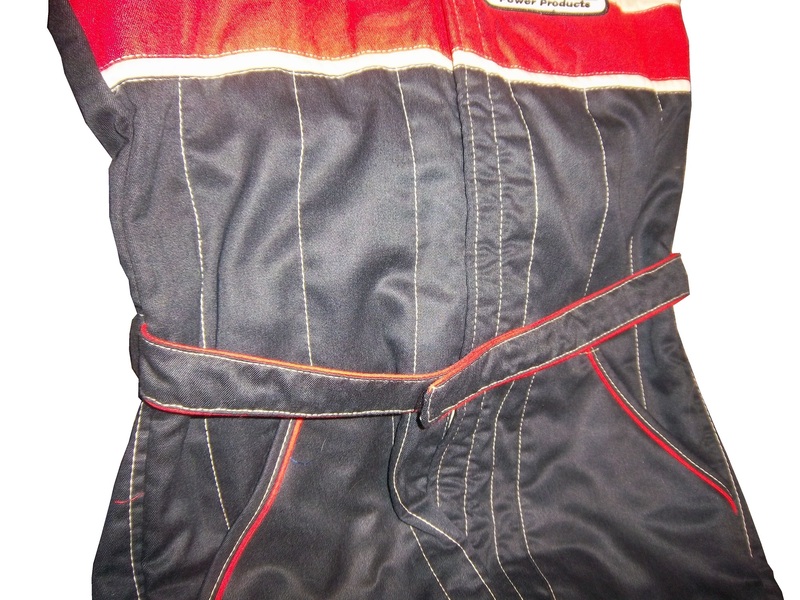 One aspect of driver suits that has become a target for new customizations in the last 15-17 years is the belt. 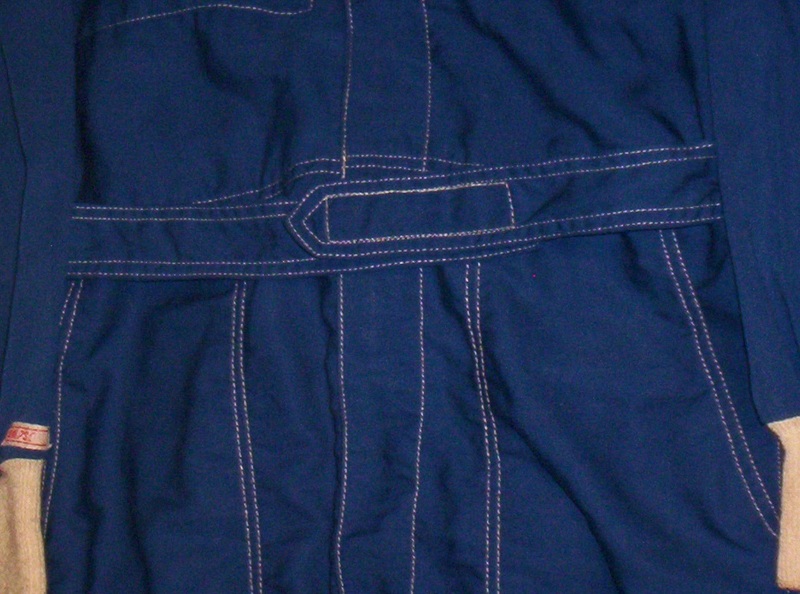 For many years, the belt was unadorned, or had a very small logo. 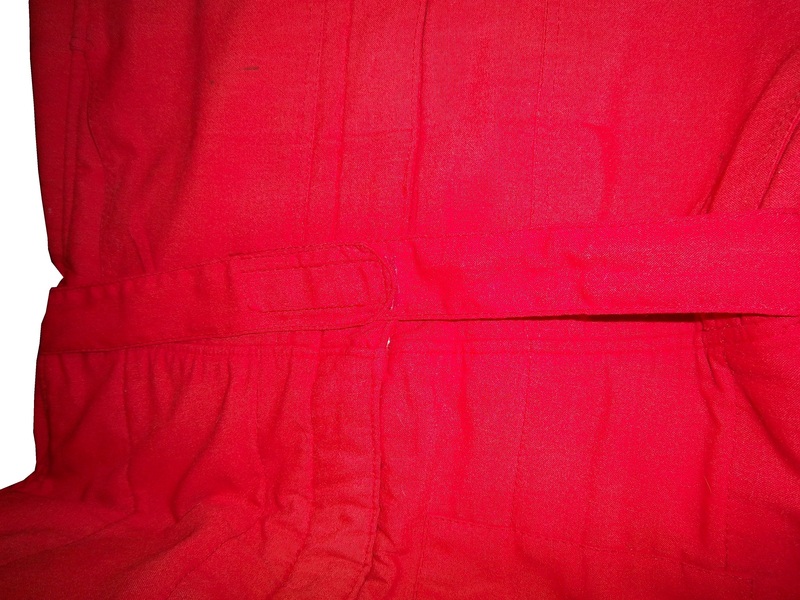 Belts are a comfort feature, and typically made of the same material that the suit itself is made out of, with the same amount of layers and has a Velcro closure on it. Belts may incorporate a border made with an alternate color, to help it stand out. 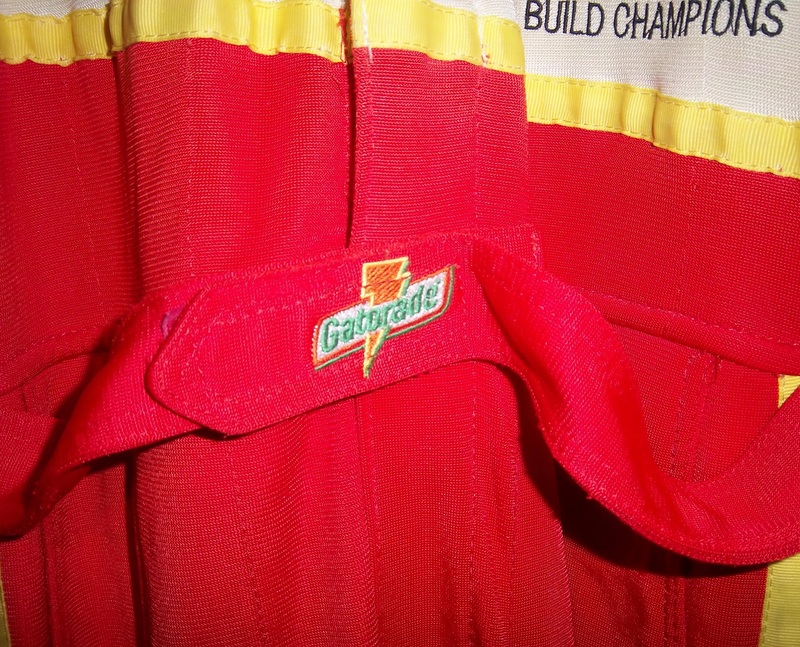 Belts had no design or decoration on them for many years, as examined by this Ted Musgrave example from 1995, this Ricky Craven example from 1996, and many more. But it was around that time, that something began to happen. 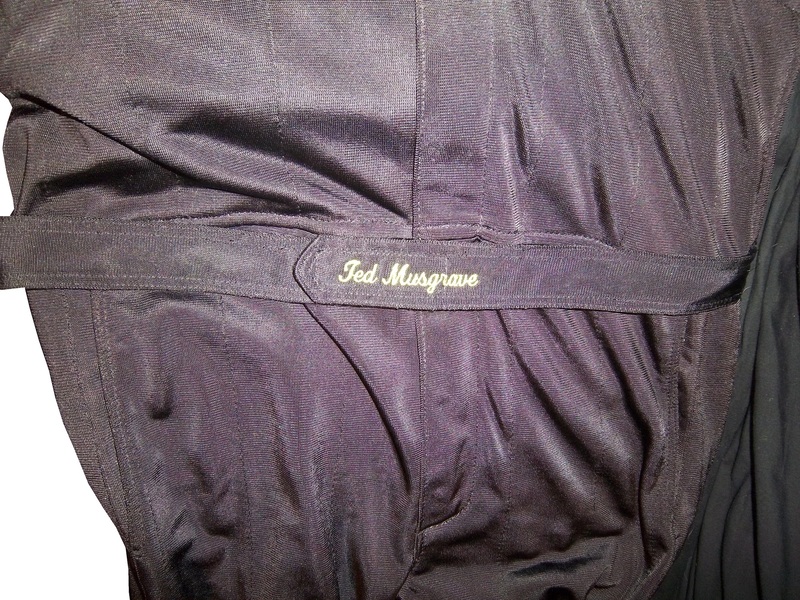 Looking at the Ted Musgrave suit from 1995, his name is embroidered into the left-chest area. 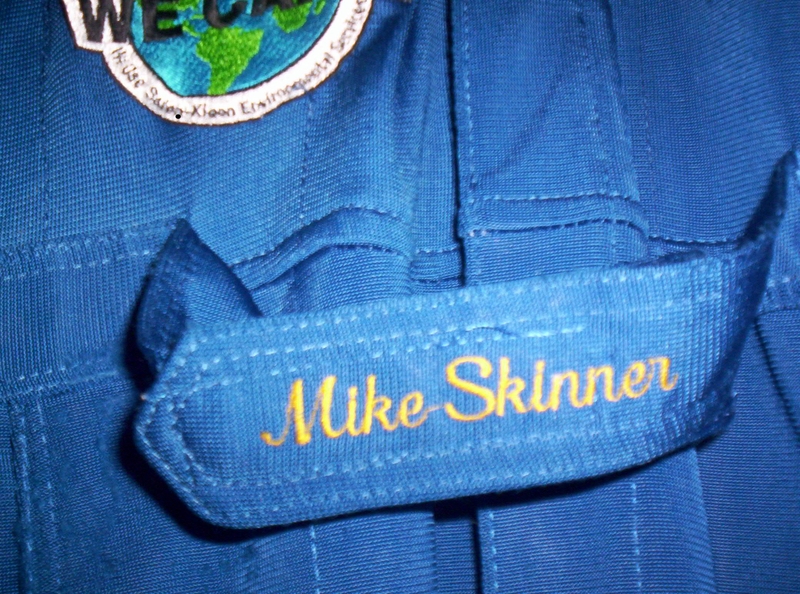 In 1998, this had changed so that his name is embroidered into the belt. 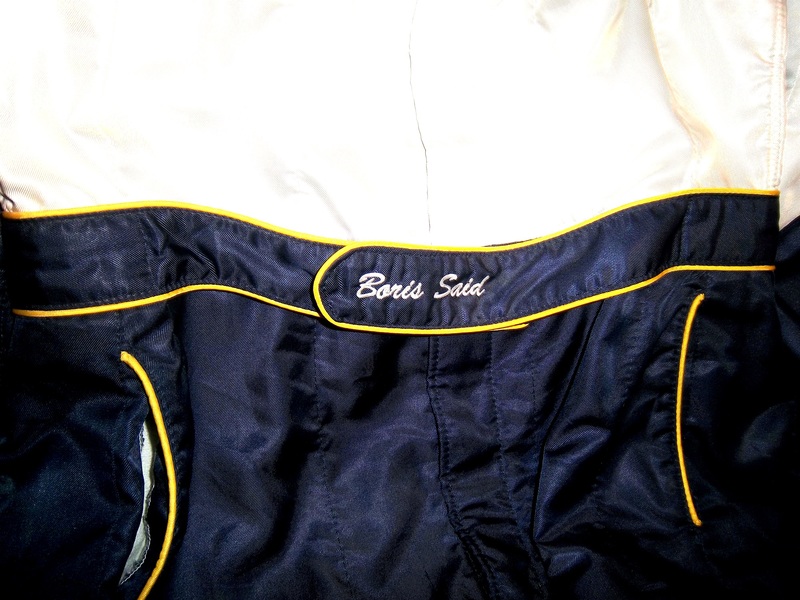 This was popular in F1 and IndyCar for many years, and is still the way that names are presented on the driver suit. 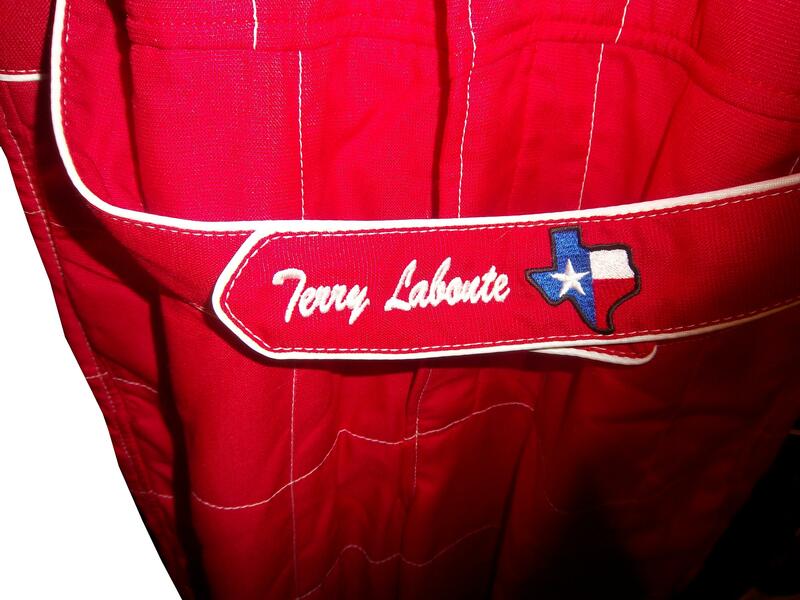 Other examples, such as this Randy Lajoie example circa 1999-2000 will have a sponsor logo embroidered into the belt. 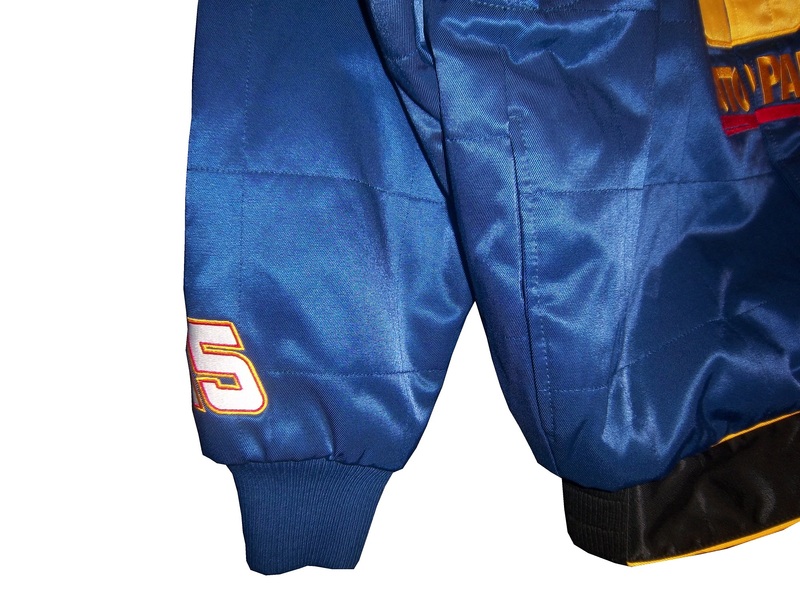 Kasey Kahne wore this suit in 2005 at an event, and it has a GOODYEAR logo on the front, and when the belt is opened, on the inside, the FIA certification is present here. Formula 1 and IndyCar have a unique quirk to the design. 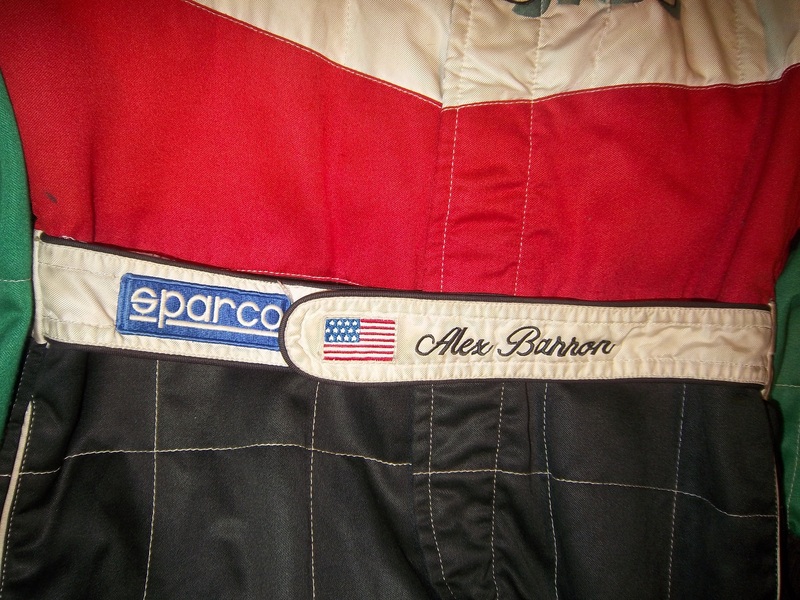 Since the drivers come from all over the world, the flag from the driver’s home country is sewn into the belt, such as this Alex Barron example from 1998: Not all belts are created equal. 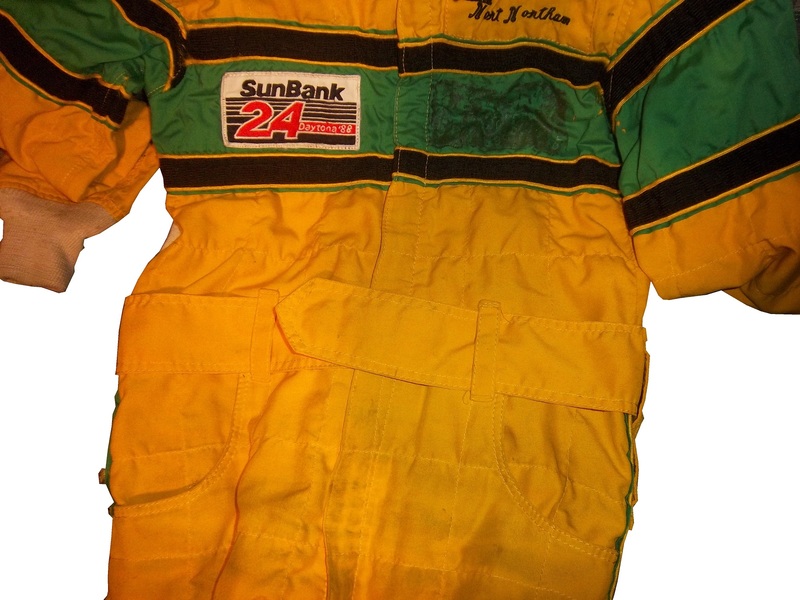 Christian Fittipaldi didn’t wear belts on two of his NASCAR suits. 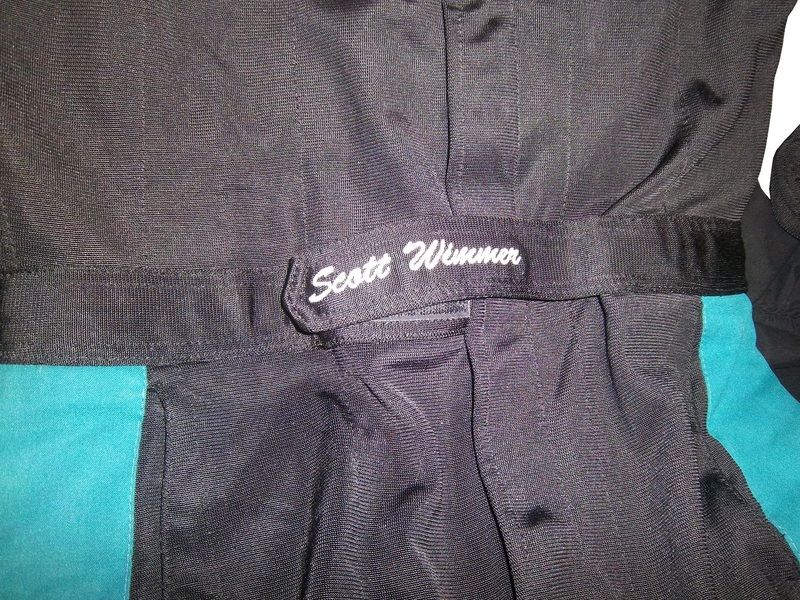 The first one, comes from 2002, while he was sponsored by Georgia Pacific, and instead of the belt, he just has his name sewn into the suit. 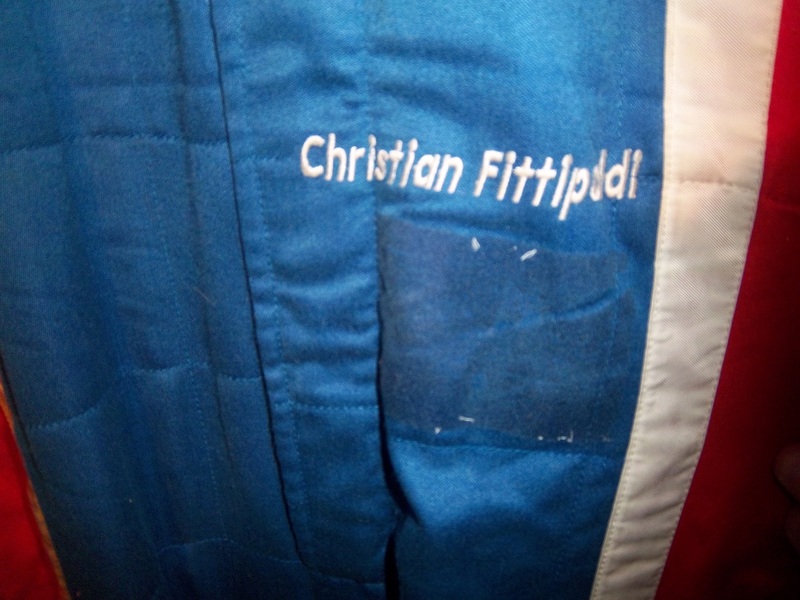 This Christian Fittipaldi example from 2003 features no belt, and no name. 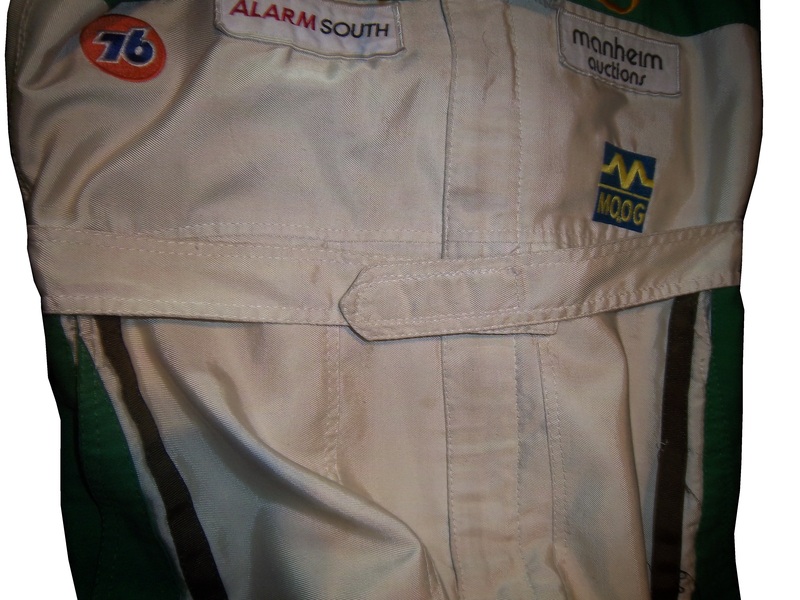 This Nate Northam example from the 1988 Sunbank 24 at Daytona, now the Rolex 24 at Daytona, features a belt that is specifically designed to be removed. Many NASCAR action figures will feature the belt designs on them, and many of these figures are pretty accurate, but I think I’ll save that for another blog. Just for fun, I’ve decided to add a recipe that can easily be made while tailgating at the track. This is my recipe for beer-broiled brats. This works well in the fall, during the Chase, on a cooler day. Take the 6 pack, and pour it into a large pan. Place the pan on the grill or stove, and add 1/4 the jar of sauerkraut, the onions, salt and butter, and finally the brats. Bring to a boil and boil for 8 minutes. Tip-Do NOT cut or puncture the brats in any way, the casing keeps the juice, and taste in the brats. For more flavor, let soak after cooking. DO NOT OVERBOIL THE BRATS, that is the best way to ruin them. After grilling the brats, toast the buns on the grill for 20 seconds, place the brats in the buns, and serve. For sides, I would recommend some mustard potato salad, some potato or tortilla chips, and, of course, plenty of ice-cold beer! This recipe will rock your tailgating party at the next race, and I will post more simple recipes for tailgating in the near future. Jamie McMurray #1 McDonald’s/Monopoly Chevy SS The simple design is good, but the color scheme needs a lot of work. Beige does NOT work on race cars, and this is a perfect example. The Rich Uncle Pennybags(or Mr Monopoly) wearing sunglasses is not very attractive either, so I can give this scheme a C at best. Juan Pablo Montoya #42 Depends Chevy SS Is this a good look? Depends! Joking aside, this is not a very good scheme, the green logo works, but the black and grey scheme is awful. Aric Almirola #43 Smithfield Helping Hungry Homes Ford Fusion A patriotic scheme, mixed with Petty Blue, that is not overdesigned. Giving this scheme an A is not going far enough to describe how good it is. Jimmie Johnson #48 Lowes/Disney’s Planes Chevy SS While I like the color scheme and basic design, the hood logo is awful. The door number has a black outline, and it is very visible, but the hood logo which does not have a black outline is next to invisible, which defeats the purpose of having a logo on the car in the first place. That said, it is still a good design, and I will be generous and give it a B.
Travis Kvapil #83 Burger King Rib Sandwich Toyota Camry BK Racing has a lot of great schemes this year, and this is another one. Great color scheme, great overall design, and I like what they did with the rib sandwich. I’m not a “Rib-wich”guy, but I like this, and give it an A.